Back in November when I played 4e for the first time with my college doggz, our DM had a couple of measured squares of cardboard that proved really useful in visualizing blast and burst ranges. These simple aids came in surprisingly handy and so I recreated them with PowerPoint. 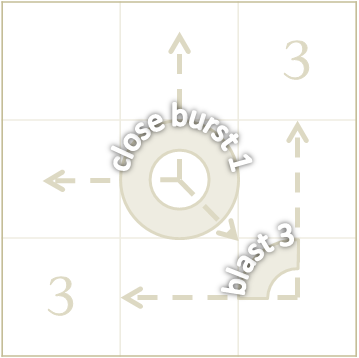 You’ll find a single slide with blast 3, 4, and 5 square templates. I printed these onto a label sheet which I then stuck to a nice piece of stiff cardboard. A bit of X-ACTO work and voila… squares.